Epiphytic plant with short stem and fleshy roots. Leaves sub-distichous, elliptic-obovate, slightly and unequally bilobate at apex, being able to exceed 14 cm. long for 3,5 cm. wide. Flower stalk erect, cylindrical, twice shorter than leaves. Flowers white, very few, from 4 to 8, small (1,5 cm.). Bracts subulate of 1 mm long. Dorsal sepal erect, oblong-obovate, apex rounded. 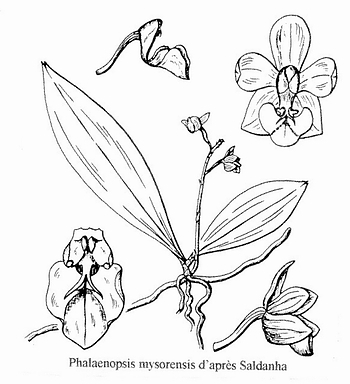 Lateral sepals oblique, sub-ovate, sub-acute. Oblong-obovate petal, round. Lip articulated with the column base, 3-lobed. Lateral lobes parallel with the column, yellowish, sub-oblong, very slightly denticulate, oblique and curved at their apex, provided with a sub-terminal opening at unequally denticulate margin and with an orange lobule at the base of the interior margin. Midlobe porrect (outwards directed forwards), triangular-reniform with a triangular concave depression in middle, marked outside by indentations on the margin and by two faint radiating ridges irregularly thickened at base. At base of the midlobe there is a forked, filiform process, flanked of two small teeth. Column with bifide rostellum and well developed foot. Pedicellate ovary of 6/7 mm long. Collected at an altitude of 900 m.
Lateral lobes of lip and nature of the forked appendix are atypical for this section. Moreover, the geographical insulation of this species in the south of India would suggest that it is not a question of Phalaenopsis but perhaps of an intermediate link between Phalaenopsis and Kingidium (Sweet). Phalaenopsis mysorensis was placed in the Deliciosae section by Christenson in 2001 with Phalaenopsis deliciosa and Chibae.